When you've agreed with someone on an offer, it's time to choose a place to meet. 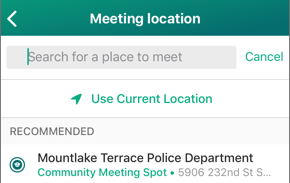 Find a convenient location with the app and share it through Messages. Tap and open your messages with the person you’ll be meeting. Tap at the bottom of the screen to pick a location. You'll see a map centered on where you are. To search, tap the search field and type a business name or street address. Any recommended spots will be highlighted. Select the location you prefer, then tap Send. Both of you will get a link to the location in your messages. Tap View Map to see details.